The oh-so-delicious mouthwatering combination of chocolate and hazelnut in cupcake form! 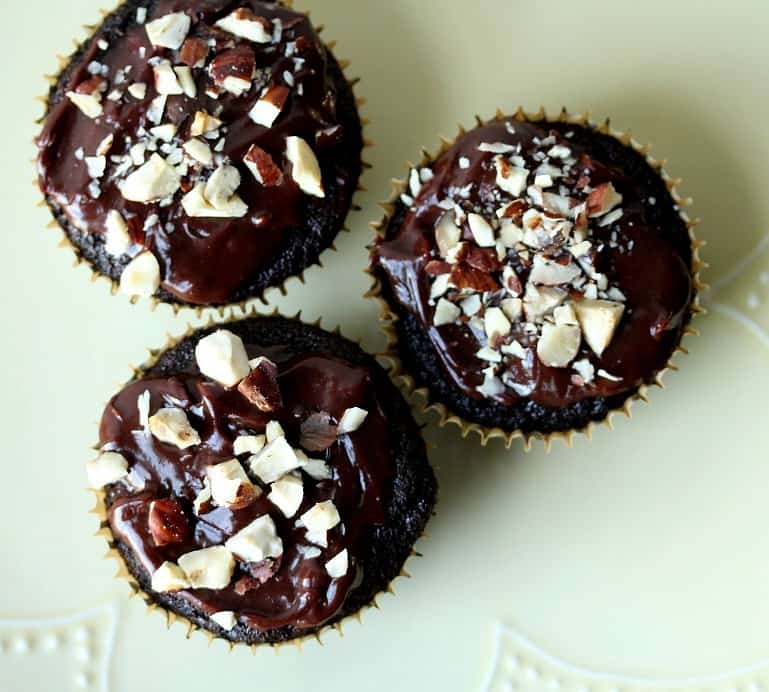 This Chocolate Hazelnut Cupcakes recipe only gets better when topped with ganache icing! Do you know anyone who doesn’t like chocolate and hazelnut? I cant say that I do. I mean if someone told me that they don’t like that infamous chocolate hazelnut spread better known as Nutella, I’d probably look at them like they were from another planet. Everyone knows that that stuff is downright addicting, right?! My oldest son just recently discovered his love of chocolate hazelnut spread. I may or may not have been keeping it from him so that I could have just one little sweet indulgence that was all for me! Either way, the secret’s out now. A couple weeks ago, he was literally dipping anything he could think of in it! He finally turned to just eating it straight off the spoon – my personal favorite way to indulge as well! Being the good mom that I am, I had to bump this recipe up to the top of the never ending to-do list… just to make the boy happy, of course! I had been planning to make this Chocolate Hazelnut Cupcakes recipe for a long time! It kept getting pushed to the back burner, and now that I’ve eaten about 6 of them (for testing purposes! ), it was crazy to have waited so long! They are delicious!! Having all your ingredients ready to go before you start baking will make things flow so much smoother with any recipe. With these cupcakes, I would recommend going ahead and mixing your dry ingredients in a medium bowl. Pre-measure and set out all your other ingredients as well. Line your cupcake pan with cupcake liners, and preheat your oven. While the cupcakes are baking, clean up and then start working on making the ganache icing so that it is ready to go when the cupcakes are cool, and chop the hazelnuts. This recipe is a simple adaptation to a classic chocolate cupcake. I used hazelnut extract in my go-to chocolate cupcakes recipe so that every bite would be full of hazelnut flavor, then topped them with ganache icing. A sprinkle of chopped hazelnuts to add a little crunch finishes them off! Presentation is everything! Not really, but it is a fun part of cooking and baking! Good looking food always gets eaten! To make these cupcakes look “professional” try using fun cupcake wrappers to start. You can spread the icing on and swirl it around with a butter knife (as seen in the photos) or let it set up a little more firmly and add it to a pastry bag fitted with the piping tip of your choice. I hope you love these Chocolate Hazelnut Cupcakes with Ganache Icing as much as we do! Be sure to let me know how it goes – I love hearing from you! 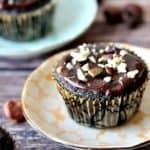 * If you’re gluten free, or have friends or family member who are, check out my Gluten Free Chocolate Hazelnut Cupcakes recipe! 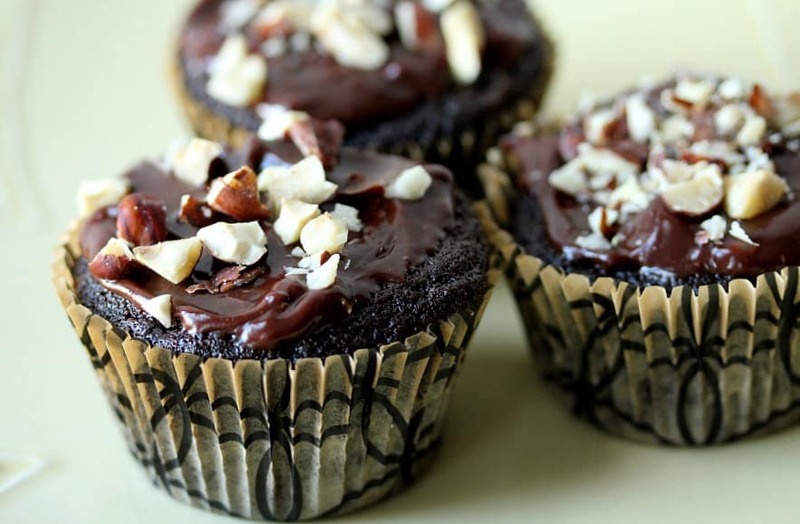 The oh-so-delicious mouthwatering combination of chocolate and hazelnut in cupcake form! Preheat oven to 350° F. In a small bowl mix together the flour, baking soda, baking powder, salt, and cocoa powder. Set aside. Pre-measure and set out all your other ingredients as well. Line your cupcake pan with cupcake liners. Fill each cupcake liner about 2/3 of the way full. Bake approximately 16 minutes or until a toothpick inserted into the center comes out clean. While the cupcakes are baking, clean up and then start working on making the ganache icing so that it is ready to go when the cupcakes are cool, and chop the hazelnuts. Once the cupcakes are cooled you can either dip them into the warm ganache or spread it on with a butter knife and top with the hazelnuts. If you want a thicker icing, let the ganache cool and more and then pipe or spread it onto the cupcakes and top with hazelnuts. 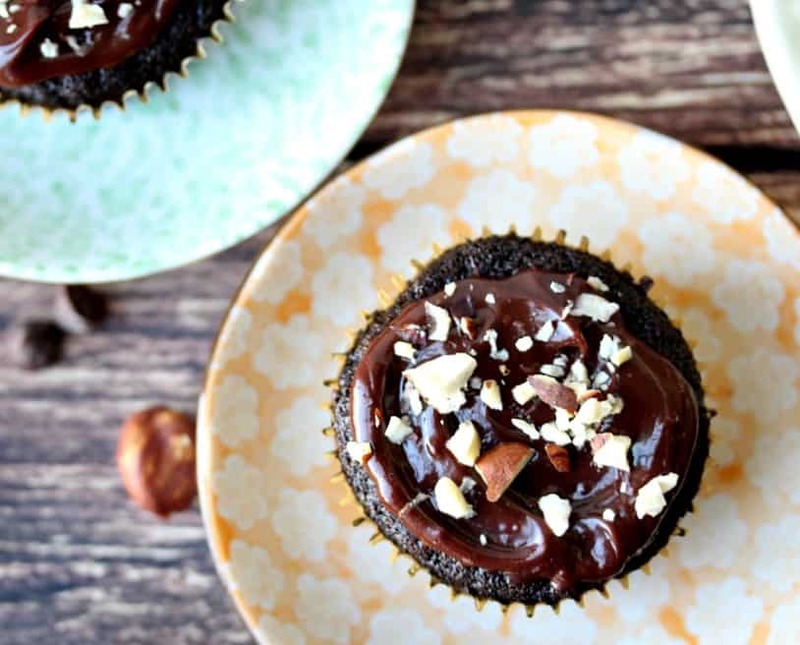 You had me at hazelnut…then sprinkled them on chocolate frosted cupcakes…gimme all of them! These are gorgeous and I never thought to sprinkle nuts on cupcake frosting but, cheers to making them healthier and eating more 😉 Just pinned this to my cupcake collection…thanks! Oh wow, these cupcakes are incredible!!! I love it! I am going to try this out. Thank you for sharing this great recipe. YUM! That icing looks like absolute perfection! I particularly like your addition of hazelnut extract – I’ll be looking out for that in my local store. These cupcakes are lovely and adding nuts as decoration is a great way to get kids on board with eating them. Hey, you’ve skipped the number of eggs in the ingredient list. I am SO sorry…I updated my recipe card and it’s looking like a random ingredient here and there didn’t transfer over…you need 2 eggs. I’m updated the card now – thank you SO much! OMG they look yummy!! I cant wait to do them thanks for share the recipe!